Summer’s here, folks! And so is the season of barbecue! Ha! 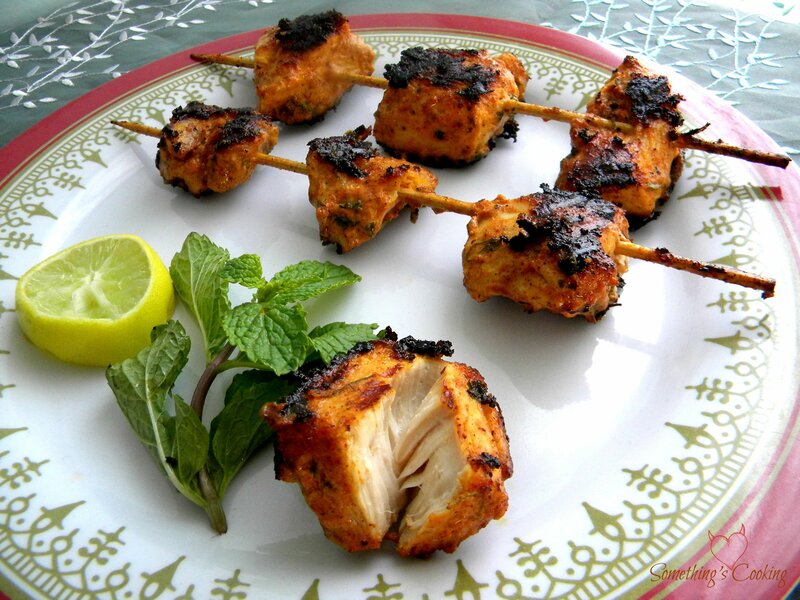 Who doesn’t like those juicy succulent Chicken Kebabs? Excellent as starters especially when you have guests at home. Or why not surprise your loved one? P would love to gorge on this at any time of the day. 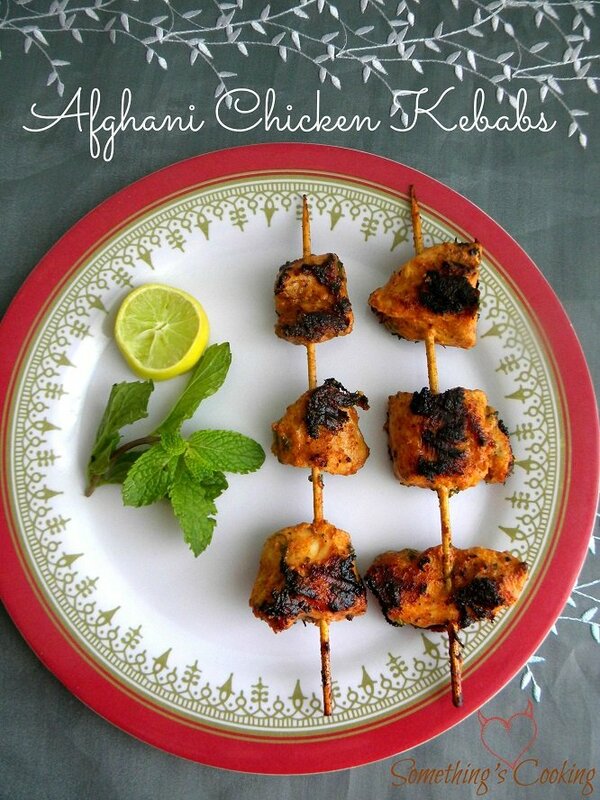 Afghani Chicken Kebabs is a delightful dish coming straight from the Mughal era. The chicken thighs are cut into bite sized chunks and are marinated with yogurt, lemon juice and spices. 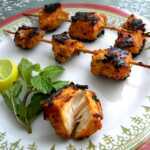 The yogurt and spice marinade is left on the chicken for a good two hours or even over night and acts as a brilliant tenderizer. 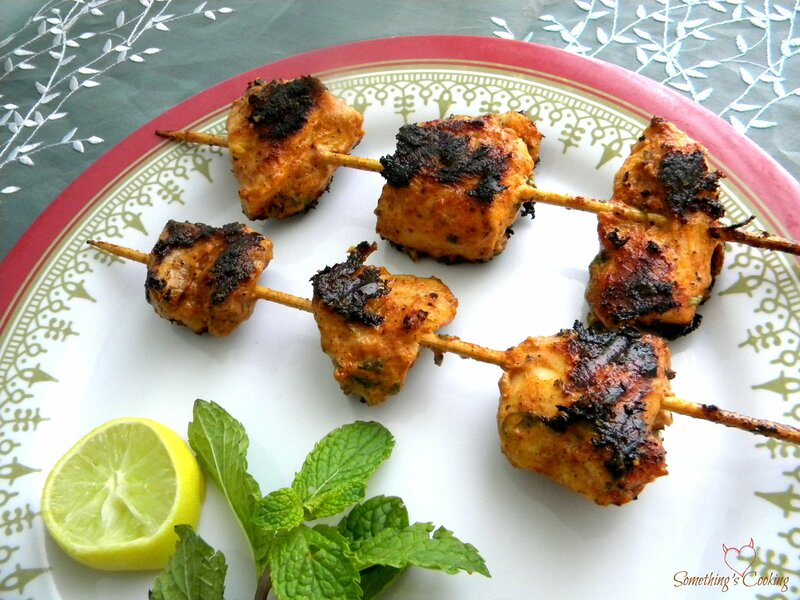 And it is this mix which is the secret to the savory kebabs. Cut chicken breasts into cubes. In a bowl, whisk together yogurt, ginger garlic paste, lemon juice and oil. Add other ingredients as well and mix well. Marinate the chicken pieces with this mixture and refrigerate for a couple of hours. You can also keep it overnight. Serve hot with Mint Dip/Chutney. I’m participating in the #AtoZChallenge and I’m posting 26 easy Chicken Recipes making your mouths water and tempting you to cook up a storm! Meanwhile, here are 26 Army Wife stories to read on my Tomato Blog! Thank god there is no penalty for plagiarism of a recipe 😀 I plan to plagiarize all of your 26 recipes.. Love chicken. Aww.. that’s so sweet of you. Please try and let me know how it turns out! That looks delicious! One plate please 😉 Looking forward to B now! Wow! This looks so delicious. Wish I could cook here. I would have definitely tried this recipe this weekend. Will try it out when I get the opportunity to cook. Yes please. Let me know how it turns out. Oh how delicious this looks! Why can’t you? You are a good cook! I don’t really like chicken but these look yummy! oh wow this looks delicious!! You are amazing!! Looks good to eat Shaluse..and easy to prepare ! Twenty-six chicken dishes, you say? Sign me up then. Look forward to more, and to trying this one out. Well the pictures are so good that I am worried I just might lick my computer screen. Aww.. that means a lot to me, ME. I’m trying my best. Glad it is turning out good 🙂 XOXO! 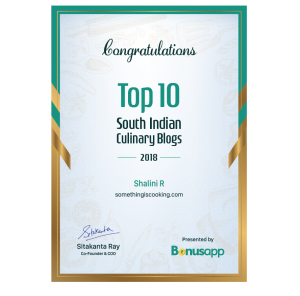 I have already bookmarked this blog of yours. And 26 more dishes to try. Yummy! Keep coming back, Roshan. Delight to have you around. Happy AtoZ! Sounds easy to make and looks good to eat. Perfect! I love love love this as a starter!! And I so want to pick from the pic above! Super delicious recipe and awesome photography !! Absolutely yummy combination. Super tempting. This looks so yummy! Alas, summer is here – I am strictly a winter cook 😉 But I’m going to save this recipe to try soon!! 🙂 Please do. Thanks for stopping by! Looks Yum Shalini. I have to make this some day. I’m emailing all the recipes you post for this challenge to mom, and sharing it. I have absolutely no idea about cooking, and I can only gasp in wonder looking at the beautiful presentation. Please try them too. They are quite easy to prepare! Thnaks, Chandni. Will definitely post some veg recipes once the challenge gets over. It looks Yummy. Saving fo future use. Looks delicious and I like how easy it is to make!